On our next day at Oktoberfest, we had a choice between going back to a beer hall early, or going out to Dachau in the afternoon and then heading into the show grounds that night, so because I am a bit of a history nut, especially World War II history, I was very interested in going out there for a look. If you do not know the story of Dachau, it was basically the first prison for political prisoners in Nazi Germany, later turned into the first concentration camp, and used as a template for other Jewish concentrations camps. It was not an extermination camp, but there were still more than 30000 people killed there. The living conditions were just deplorable, it was a pretty moving experience for me. I didn’t take any photos whilst we were there. I just felt that would be wrong. I wasn’t there as a tourist, I was there to pay respects to so many people, and probably more so to learn about the horrific things the Nazis did to the Jewish people. I have always had a fascination with some of the more macabre moments in human history like this. It seems inconceivable to me that someone could take the life of another human, let alone try to wipe a whole group of people off the map. So to me, taking photos kind of felt like dancing on the grave of the people who died there. I have included a photo of the gates of Dachau just for something to look at, that I took off Wikipedia, and I would urge you all to read the wiki article too. 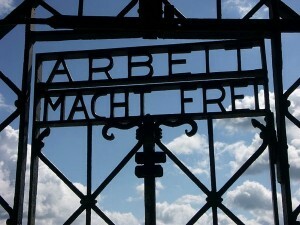 The entrance to the concentration camp, which says “work will set you free.” How tragic is that.